As a continuation of the celebration of Incorporation Day – the day Srila Prabhupada received the certificate stating that ISKCON was officially incorporated – and the 50th year anniversary of ISKCON, Bhaktivedanta Manor held the grand opening ceremony of the Srila Prabhupada garden to honour the spiritual leader and founder of ISKCON along with his disciples. Devotees from across the country and many of Srila Prabhupada’s direct disciples from around the world, gathered on the 16th of July 2016, for a day dedicated to expressing gratitude to Prabhupada, for making the perilous journey to the west, and changing the lives of people for generations to come. The celebration began with the abhishek of Srila Prabhupada in the temple room, in which all the assembled devotees could partake. Srila Prabhupada was then carried out and around the temple to the sounds of cymbals, drums and joyous devotees chanting. He was brought into the gardens and placed in his altar, to view the opening. The temple president Sruti Dharma Das commenced the opening ceremony by welcoming the chief guest, Yogesvara das. He spoke of the garden being an offering to Srila Prabhupada and his disciple. Referring to the traits of good gardeners as being attentive, forward-looking, dependent on the weather, hardworking and patient he compared these to Srila Prabhupada and his disciples who too possessed these qualities, although, they are dependent on Krishna. Kripamoya Das too spoke about the aptness of a garden offering, by likening ISKCON to a sequoia tree in the garden, whose seed had been planted by Prabhupada and whose disciples were the branches that spread the philosophy around the world. Gauri Das shared a conversation he’d had with George Harrison’s wife, Olivia Harrison, who thought he would have loved the garden because it would have made people come to the temple and thereby learn. One of the most important things to learn is the nature of the relationship between guru and disciple because that can raise us above this material world and bring us back to Godhead. Because of that relationship between Srila Prabhupada and his disciples, Krishna consciousness spread throughout the world. Hence, the defining qualities of this unique, spiritual relationship were engraved on stones around the garden and some of Srila Prabhupada’s direct disciples stood on these stones and elaborated on each quality, with extracts from the Holy Scriptures and stories of their time with Prabhupada. These qualities are enquiry, homage, service, shelter and realisation. Jahnavi Harrison interspersed devotees’ speeches on each of these qualities by singing a verse from the Guru Vandana. A plague, stating the dedication of the garden to Srila Prabhupada and his disciples was then unveiled. A verse from the Sri Caitanya-caritamrta that encapsulates the deep and ever-lasting bond between guru and disciple is inscribed, like a necklace around the central fountain in the garden. 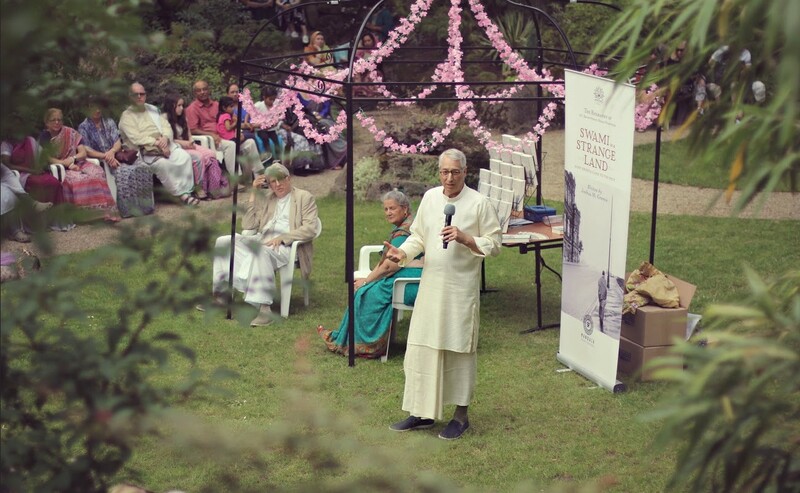 The garden opening was followed by the launch of the book Swami in a Strange Land, written by Prabhupada’s disciple Yogesvara Das. The book is a biography on Prabhupada, written to not just be enjoyed by devotees but also teach non-devotees about the life of Srila Prabhupada. The book was therefore also an offering to Srila Prabhupada on the 50th year anniversary as a means to further Prabhupada’s desire to propagate Krishna Consciousness around the world. Devotees praised the book and its ability to sufficiently highlight the depth of struggles Prabhupada faced in his mission in this world, without diminishing the fact that he was a truly extraordinary being. Assembled guests were able to collect signed copies of the book and were then served a grand prasadam after which Yogeshwara Das gave a PowerPoint presentation on his book. As Srila Prabhupada once said; “When the sun shines, there no place better than the Manor” and indeed, in the blissful summer weather and amongst the beautiful flowers of the garden, there really was no better place to celebrate his divine grace and his followers.